Preschool teachers are responsible for preparing kids of 3 to 5 years for kindergarten. They educate preschool kids the way they can understand. Kindergarten and elementary teachers teach students basics of math, science, social studies and reading. They make basic concepts clear and teach how to apply them. They also monitor their performance and inform about it to parents. High school teachers prepare students for life after their graduation. They teach secondary education subjects like history, biology and many more. They conduct tests regularly to know about students’ performance. They help students overcoming their weaknesses and using their strengths. 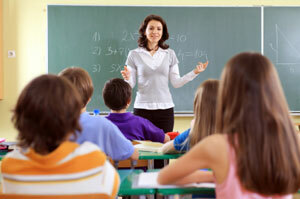 Post secondary teachers are for the students who wish to pursue higher education. They teach wide varieties of subjects like nursing, health care, business and many more. They teach students who aspire to attain a degree or a certificate. They impart knowledge to students in order to polish their skills. Special education teachers deal with students who are mentally or physically challenged. Special skill-set to use special technique is required and used to teach these kids as compared to normal students. Regular observation and update of kids’ progress has been shared with the parents of such kids. Early childhood education will help to develop and improve a child’s social and intellectual skills. So, number of students taking preschool education might get increased which might increase demand for preschool teachers and kindergarten teachers. Number of high school students is expected to increase so the demand for high school teachers may also get increased. After their schooling, number of students going to college or university to pursue their degree may get increased as they want to achieve their career goals. As a result, need for professors or post secondary teachers may also increase. Children who need special care and education are being recognized earlier resulting into increase in number of teaching schools. Moreover, retirement of old teachers may increase need for the new ones. Hence, demand for special education teacher may increase in the near future. Ideal for: Those who wish to pursue the highest level of academic degree or who wish to become a professor or principal. Ideal for: A graduate in wish to pursue higher education to become principal. Ideal for: Persons who wish to pursue more education to become teacher. Ideal for: Entry level job position in field of teaching. Duration: It ranges from 2 months to 6 months. v Ideal for: Entry level jobs to work as a certified teacher. According to the bureau of labor statistics , employment of preschool teacher is expected to grow by 25 percent, elementary school teacher by 17 percent, high school teacher by 7 percent, post secondary teacher by 17 percent and special education teacher by 17 percent during 2010-20.